The new designs for the book covers of the Bard's plays have a minimalist, modern ethos. How do you create images that encapsulate William Shakespeare’s plays? For years, the answer was to slap a picture of the Bard or a staid Renaissance-era painting on book covers and call it a day. But in the late 20th-century, publishers started to mix it up, hiring design giants to lend their individual styles to the book covers of each new edition of his plays. 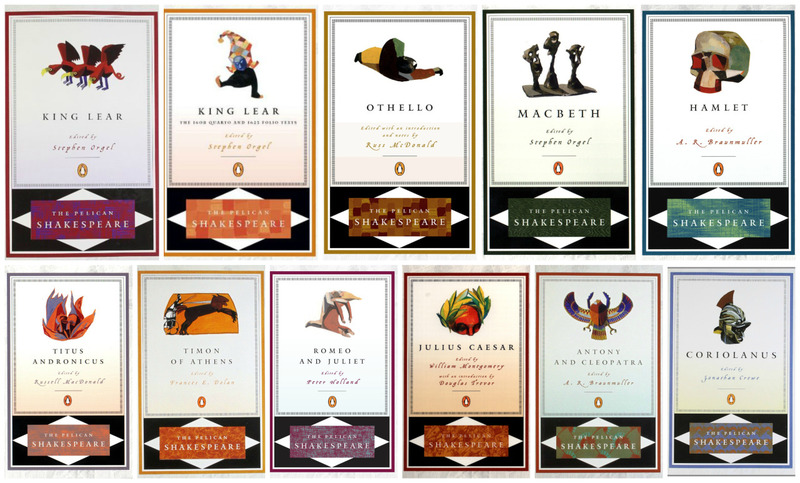 The graphic designer Milton Glaser’s Shakespeare covers look artfully half-finished, a combination of black line and brilliant color; the British artist David Gentleman worked on his cartoonish wood engravings for nearly a decade; the Italian artist Riccardo Vecchio created dynamic color-block illustrations for editions in the late-’90s. Still, it’s time for an update. The first volumes of the Pelican Shakespeare’s latest iteration, which hit bookshelves this week, are bold and very different from their more traditional predecessors. Designed by the 24-year-old Indian-born artist Manuja Waldia, each new cover features a single graphic icon, interpreting works including Hamlet and Romeo and Juliet through a contemporary, minimalist lens. Waldia brings a design sensibility shaped by the clean-lines aesthetic of the digital world to centuries-old classics: Inspired by modern imagery—app icons, street signs, maps, statistical visualizations—as well as ancient symbols like hieroglyphics, she translates Shakespeare’s work into the visual language of the 21st century. The challenge when it comes to designing Shakespeare book covers lies in creating images that encapsulate the essence of each story for new readers, while also offering returners the chance to see something new in the old text. Waldia told me that distilling each play’s characters, plot, and themes into a single image was like fitting together puzzle pieces. Her cover for Macbeth, for instance, is an abstraction composed of symbols: A tiara pours blood onto a nobleman’s crown to signify Lady Macbeth’s influence on her husband’s bloody motives, while a crossed scepter and dagger nod toward the intersection of violence and power. Paul Buckley, Penguin’s executive creative director, said he chose Waldia for the commission because her clean, linear style effectively offers a new visual spin on the Bard’s timeless stories. The new covers speak to the ongoing efforts over centuries to better understand and appreciate Shakespeare. My colleague Megan Garber recently reported that the scholar David Crystal is introducing Shakespeare readers to the plays’ original pronunciation in order to help readers understand their myriad layers of puns. Waldia’s hope is that her work can offer a different degree of illumination.